Lead by collective member Taryn Hubbard, a Place to Sit and Think is a year long journaling series where participants can come together for an open and uninterrupted time to think and reflect through journaling, as well as a chance to connect with residents throughout Surrey. The first session in the Place to Sit and Think series will take place at the PopUp Newton Gallery as part of SOFIA/c month-long residency there. Join us Aug 20, 2016 at 11 a.m. for an open studio of journaling. All supplies provided. Join us for the Opening Event kicking off a month-long artist residency hosted by the SOFIA/c (South of Fraser Inter Arts collective). We will be activating the Pop Up space in Newton with an exciting array of artistic events, workshops, collaborations and artists-in-residence from August 6th through the 26th. Interdisciplinary artist Charis Au will create a multisensory interactive performance involving the culture around food. This event will coincide with the Farmer’s Market on August 6th. Interdisciplinary artist Roxanne Charles will be working on a blanket with community involvement to engage in a discussion about the importance of women in indigenous communities. This discussion will acknowledge the historical, systematic, domestic, and lateral violence against indigenous women. Through this collaboration in making, Roxanne Charles looks at culture as a means of healing and women as a crucial part of the healing process. Interdisciplinary artist Polly Gibbons will be doing an artist residency where she will be continuing an ongoing series of watercolour paintings. The public is invited to help create a collaborative painting that will develop over the course of the residency. SOFIA/c active space at PopUp Newton at 137st 72a Avenue, Surrey, BC is open from August 6 to August 26, Wednesday to Sunday, 12pm-4pm. The South of Fraser Inter-Arts Collective is a proud sponsor of the Surrey Art Gallery’s Sound Thinking Symposium, Voicing the City In/verse: Reading Surrey and the Super-Suburb. Our Inside/Out: Convergences of practice and community. The afternoon will feature two discussions—“Intersections: Art Practice in Convergent Communities” and “Lessons Learned: A Survival Guide to Establishing an Artist Run Centre”—with panelists and moderators from throughout the Lower Mainland, including Lakshmi Gill, Cease Wyss, Hank Bull, Heidi Nagtegaal, Aaron Moran, and Harbhajan Gill! SOFIA/c is grateful for financial support from the City of Surrey’s 2013/14 Cultural Grant Program, and to the Surrey Public Library for sponsorship on the space. This is just a quick note to announce our summer symposium is scheduled for Aug. 23 at the Surrey Central City Library. It’s an entire afternoon of talks. More details to come. 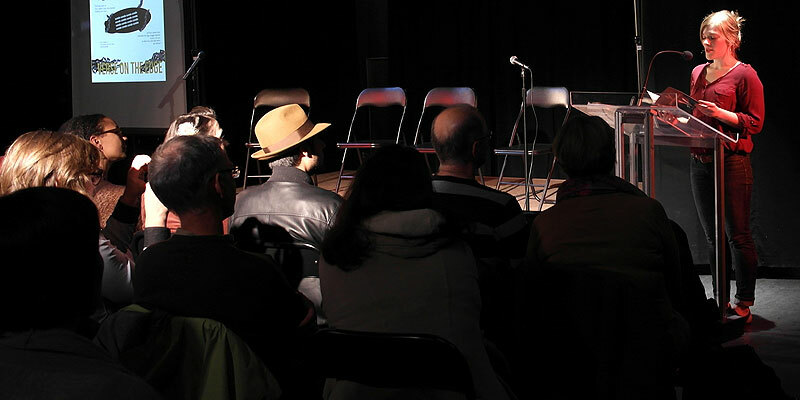 Last Friday, SOFIA/c kicked off its first event with a poetry reading at the Newton Cultural Centre. On a dark and rainy night, we had a full house of friends, family, and community members. It was exciting and humbling to see so much warmth and support for our first event. Readers Cecily Nicholson and Taryn Hubbard each shared their work, as well as Phinder Dulai who gave a special poetry reading in replace of Wanda John-Kehwin who couldn’t make it. The audience got a first listen of Dulai’s latest work. Our inaugural event was a great success, and a promising start to this budding artist collective. We couldn’t have done this event without the help of the City of Surrey’s Cultural Grant program, as well as the generosity of the Surrey Arts Council for its support of the venue. Thank you to our volunteers Jane Cleary-Dulai for baking the most delicious chocolate chip and oatmeal cookies, and Natasha Cleary-Dulai and Nadya Cleary-Dulai for staffing the book table. Please check out our photos below taken by collective member Matt Smith. Video by Edward Westerhuis to come. Phinder Dulai introduces the evening and welcomes the community to the event. Taryn Hubbard reads work from her project on Surrey City Centre. Cecily Nicholson reads from her book Triage. Edward Westerhuis working on the Verse on the Edge video. Coming soon! So on to our next efforts: film night, art installation project, and summer symposium.